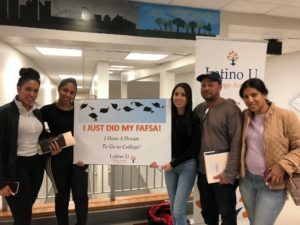 Tonight, Latino U College Access, with support from Kids’ Club, returned to Sleepy Hollow High School to conduct another FAFSA Boot Camp for college bound students seeking assistance in completing important financial aid applications. 60 families benefited from the program, wherein trained volunteers work one-on-one with students and families to complete and submit the FAFSA and NYS TAP applications, thereby maximizing their opportunity to receive financial aid and enroll in college. Congratulations to all who made this exciting night possible.